Today Morning i saw this curry recipe in my favourite TV show- AVM Managayar Ulagam. I had all the ingredients ready in hand, so went ahead without any hesitaion. 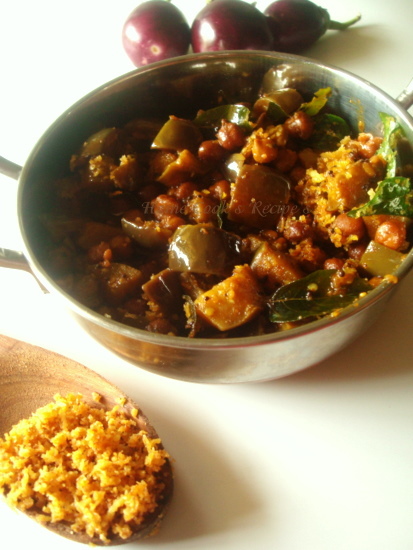 The Real name of this curry is Kathrikkaai Kuttai Kuzhambu, it means Thick Eggplant curry. It seams, this dish is from Thanjavur Cuisine, which is my favourite. Trichy and Tanjore are the best places offering vegetarian food in TamilNadu. Karaikudi is the best for Non-Vegetarians. Coming to the Curry, it tasted so different and was great with Hot Rice. 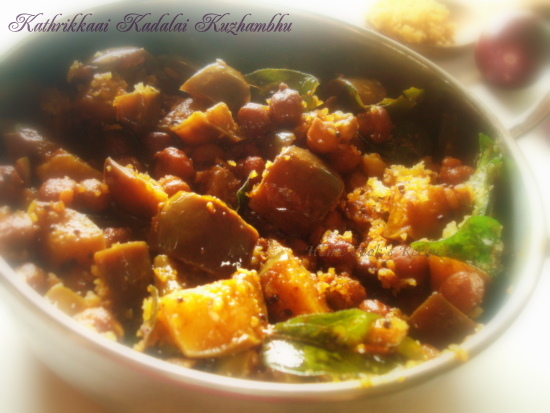 If you are having purple brinjal's in hand, and overnight soaked chickpea, then this is very easy dish to make. First Wash the Brinjal's and cut them into small pieces and put them into a cup of water to avoid the colour change. In a Heavy Bottomed Kadaai, Heat the Oil, add the asafoetida powder, mustard and let the mustard pop. Add the split urad dal and curry leaves and wait till it get roasted. Now add the Sambhar Powder and fry the powder in the oil for a minute or till a slight colour change occurs. Now add the brinjal pieces and fry them for a minute, till they start shrinking and change its colour. Now add soaked brown chickpea to the brinjal and mix well. add turmeric powder and salt to the brinjal, chickpea and mix well. Add the tamarind water and mix well. close the kadaai / Pan with its lid and let it rest on the stove for about 10 minutes in a medium flame. Add Jaggery in between and stir well. Let the Curry gets thick and then switch of the flame. Heat a tbsp of ghee in a pan and add the grated coconut to the ghee and fry it till it turns golden colour (refer the picture). add the roasted coconut to the curry and serve hot with rice. This curry got a well balanced tangyness, spice and tasted little bit sweet bcoz of jaggery. The chickpea was cooked in just 10 minutes and tasted well in the curry. The Highlight was the Purple Brinjal's which took the masala's into it and tasted excellent, iam drooling on typing this. Dont Miss to try if you are a Eggplant / Kathrikkaai Lover. The curry is looking damn temtping... nice color and ingredients will try for sure. Curry looks very tempting... loved the ingredients.. would have tasted great with that sweet and tangy taste. The combo is new to me!! curry looks yummy! Looks inviting...chickpeas with brinjal is new to me! Am a big fan of Mangaiyar ulagam too Lavi, curry looks tremendous, very inviting..
...and Lavi,I have a few surprises waiting for you in my place ..:)!! Never tried this combo...looks interesting! Nice click:)....never tried mixing brinjal and chickpeas will try it soon looking yummy with curry leaves. Hi lavi, I guess I am first time here and promise to visit you again. This combo looks very interesting and I love the eggplant. I am surely gonna try this. I tried this dish for a party and was an instant hit. Thank you for sharing!